A Pain Management Service offers access to a multidisciplinary team of consultants, psychologists, physiotherapists, osteopaths and acupuncture. 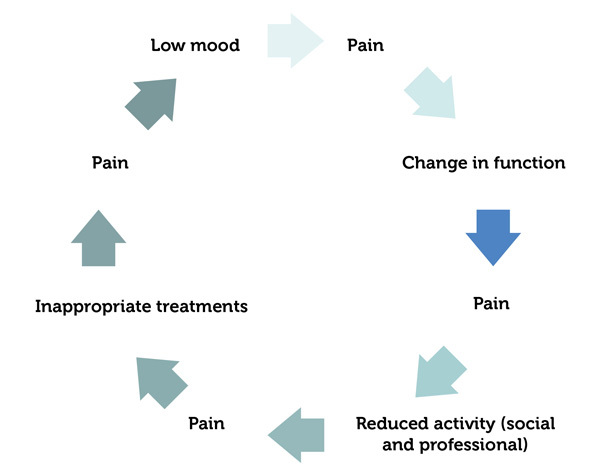 The aim is to allow any adult whose life has been affected by chronic pain to achieve optimal management of their condition and improvement in their quality of life. Chronic pain affects 1 in 6 adults and results in physical, emotional and social decline. Patients who suffer chronic pain make far more demands on healthcare than non-sufferers. This can result in inappropriate investigations, side effects from medication that may not be helping the problem in the first place causing more worry and concern. The cost to society and the individual is so great that the Royal College of General Practitioners now recognises chronic pain as a clinical priority. These may appear at first reading to be bold and dramatic statements, yet statistics back them up. In the elderly population, 80% report significant daily pain. Amongst sufferers of chronic pain who are of employable age, only 25% are in employment. Low mood affects 70% of sufferers. Sleep deprivation is almost universal. The statistics relating to investigations and medication make equally depressing reading. There is an 80% discrepancy between MRI findings and the actual mechanisms that may culminate in chronic low back pain. In another trial, 100% of patients over 65 without low back pain had an abnormal lumbar MRI scan report. Strong opioids only have a 1 in 4 to 1 in 6 chance of providing usable relief for chronic mechanical pain. It is 1 in 10 for neuropathic pain (6 for Tramadol). Side effects are experienced by 80% of chronic pain patients who are given strong opioids and these can be so severe that by six months 56% of patients will have stopped using them. At time of writing there is little if any evidence to support the use of strong opioids beyond six months. The gastrointestinal and cardiac risks of the non-steroidals are well documented. So why do tried and trusted investigations and treatments (that are of so much benefit in the diagnosis and treatment of acute pain states) have such little impact in chronic pain states? In a nutshell, chronic pain is not acute pain that wouldn’t go away. Continuous nociception (pain signals) in the nervous system (peripheral and central) produces profound neurobiological and neuroanatomical changes which not only amplify existing pain but can even corrupt non-pain messages into the sensation of pain. Chronic pain is a fire that fuels itself. Functional MRI scanning has begun to show how central cortical processing (sensory, emotional and frontal) also changes in response to chronic pain. Little wonder that investigations don’t tell the whole story and analgesics aren’t always that effective. At a human level adaptation to worsening pain produces a chain reaction. The basic human response to pain is to avoid doing things that hurt and to cut back on activity. This is reinforced by any incorrect beliefs about the cause of the pain. The result is secondary deterioration of soft tissues and worsening pain. This can reinforce belief that activity makes pain worse or is creating more harm and begins to limit social and employment activity. Fear, anxiety and low mood accompany these physical changes. Anger and frustration are an inevitable response to this and to the apparent failure of investigations and treatment. Psychological well-being deteriorates. Before long physical, emotional and social well-being are adversely affected. Relationships suffer. These effects interplay and magnify. Pain is now more than an unpleasant and distressing sensation. It has become a damaging life event. The pain is the disease. A Pain Management Service is more effective under these circumstances as it adopts a biopsychosocial approach to the problems faced by a sufferer. The first appointment after referral is with a consultant in the service. First appointments take on average 40 minutes during which time as much as possible through history and examination is found out about the nature of the pain, its generators, previously unsuccessful treatments, impact of the pain on all aspects of the patient’s life, general health and well-being, and investigations findings. At the end of the first appointment a patient will know more about their pain problem and be in a position to start managing it more effectively. Medication is optimised to provide the best chance of effective analgesia with least chance of side effects. A plan may have been made to phase out medication giving side effects and little benefit. Further appointments can be organised to access patients to help from resources such as physiotherapy, osteopathy and acupuncture. If appropriate then the patient will be offered injection therapy to target pain generators. Injections are organised for a future appointment and not performed at first assessment. Information about pain management programmes will also be offered if the biopsychosocial impact of the pain is becoming significant. Not all chronic pain is amenable to injection therapy but procedures themselves carry excellent safety profiles and can be very effective for the right patients and pain problems. The procedures our service offers ranges from simple muscle trigger point injections to ultrasound and x-ray guided deep tissue and joint injections and nerve blocks. We also offer procedures which other services may not such as radiofrequency denervation of lumbar and cervical facet joints and a similar procedure for sacroiliac joints. Facet joint pain is a significant contributor to about 30% of all chronic low back pain problems and sacroiliac pain may be present in as many as 20%. As a procedure, radiofrequency denervation is considered gold standard for providing long lasting relief from these types of pain. Most of our procedures have about a 1 in 1.3 chance of giving good relief for a period of time during which physical therapies, medication optimisation and self-management strategies can all be introduced for longer term benefit. (It is worth recalling that morphine has a 1 in 4 to 1 in 6 chance of working). In general terms, the more local or specific the pain then the more likely it is to respond to injection therapy. High quality research has shown that chronic pain patients who come under the care of a specialist multidisciplinary pain management service show significant benefit with respect to long term improvement in physical wellbeing, psychological wellbeing and social/professional function. Significant impact on overall well-being (or those at imminent risk). When the pain is not responding to medication, physical therapies, or where surgery has been discussed and advised against. Not responding to 120-180mg per day of morphine or its equivalent. (A 25microgram per hour fentanyl patch is equivalent to 90mg per day of morphine, Tramadol 400mg per day is the equivalent of 80mg of morphine per day). Other medication problems and worries. © 2019 Surrey Pain Management Services is a limited company registered in England and Wales. Registration no. 07873330.